This large TV stand exudes warmth and comfort, the perfect aura for cuddling up in your bedroom or living room for a movie night. This piece offers plenty of storage space with an three open cubbies, an adjustable shelf, and a drawer. 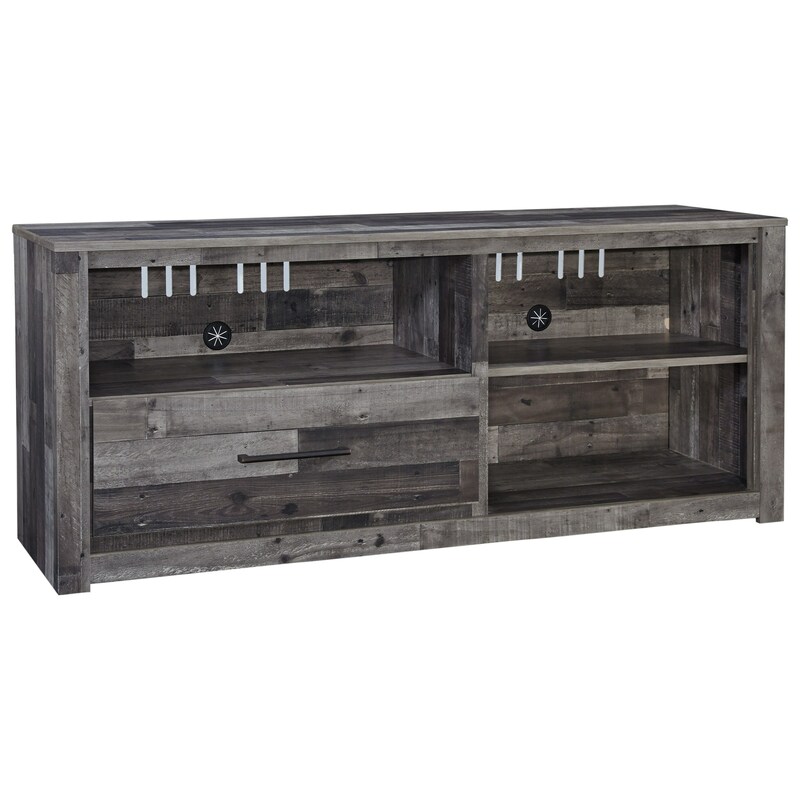 The rustic finish of this piece gives it extra visual appeal, and it will look great alongside any decor. The Derekson Large Contemporary 59" TV Stand by Signature Design by Ashley from Nashco Furniture - Nashville. We proudly serve the Nashville, Franklin, Brentwood, Clarksville, Green Hills, Davidson County, Williamson County, Tennessee area. Product availability may vary. Contact us for the most current availability on this product. Storage Media opening: 29.00" x 17.00" x 9.00" Media opening (2): 23.00" x 16.25" x 19.75" Drawer interior: 26.75" x 14.75" x 6.50"
Browse other items in the Derekson collection from Nashco Furniture - Nashville in the Nashville, Franklin, Brentwood, Clarksville, Green Hills, Davidson County, Williamson County, Tennessee area.